Register to join us on a 4½-mile canoe and kayak trip down Fishing Creek in Halifax and Nash Counties. Enjoy scenic stretches of forest, mountain laurel slopes, and farmland rarely seen by the public. Expect to see many species of wildlife on this trip. 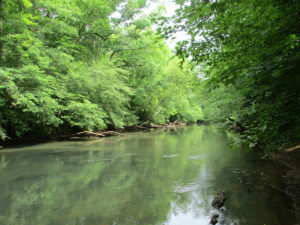 Fishing Creek is the largest tributary of the Tar River and is one of the most biologically diverse in the eastern United States. Our trip will launch at TRLC’s “Twelve Hawks Tract” located on Murray Loop Road and will end at privately-owned property located near Ward Road/White Oak Road. Please arrive at the launch site between 8:00-9:00 AM. Expect to be on the water 2-2½ hours. We’ll shuttle folks back to the launch site after the paddle to enjoy a hot dog cookout! Bring your own canoe or kayak or rent one from TRLC. To ensure a fun and safe trip, all paddlers must wear a personal flotation device (PFD). All paddlers must sign an American Canoe Association liability form before hitting the water. Swimwear and water shoes or old sneakers are recommended. Please bring a water-proof bag to stow your keys, wallet, and snacks while on the water. Have a change of clothes in your vehicle. Registration fees are $30 per person. Rent a single or tandem kayak (with paddles and PFDs) for an additional $30. All proceeds from this family-friendly event go to support Tar River Land Conservancy. Kids under 12 years old should be accompanied by an adult in a tandem kayak. Please register no later than Tuesday, May 14, 2019. Click here for directions to the parking location for the launch site.